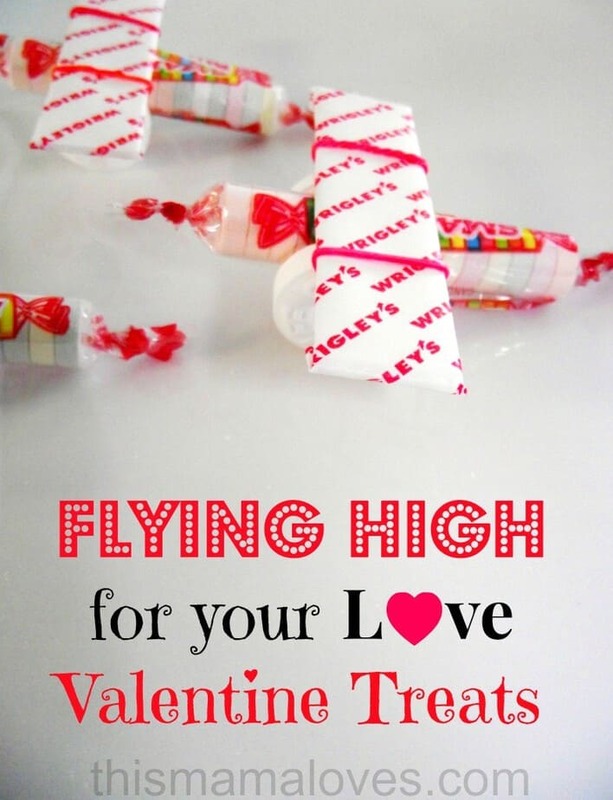 These Flying High for your love Valentine’treats are so adorable and so easy to make! 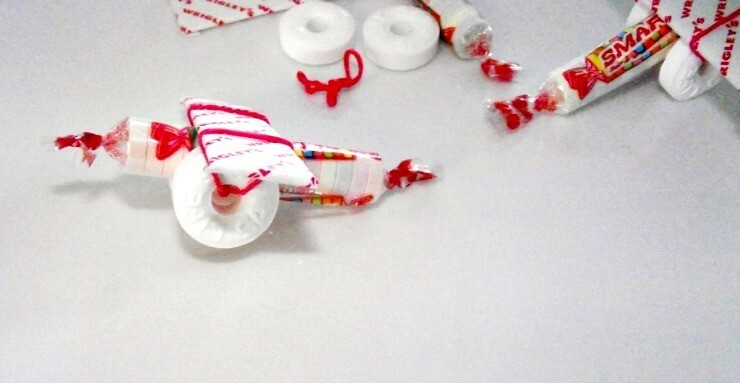 Fun candy planes that will make a great boys’ Valentine Treat to bring to classmates (girls too of course!) Smarties are Vegana, Gluten, egg, dairy and nut free so they are a REALLY safe treat idea!! You may also want stickers, pink or red paper, string, and tags for the to: and from: if they’ll be handed out as a school Valentine. 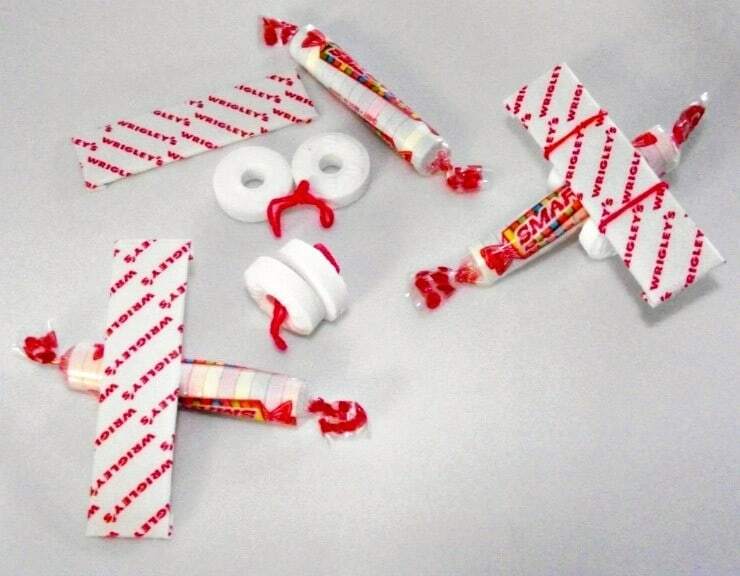 You’ll need to unwrap the mints. Slip 2 of your tiny rubber bands through one another to create a larger band with a knot in the middle. 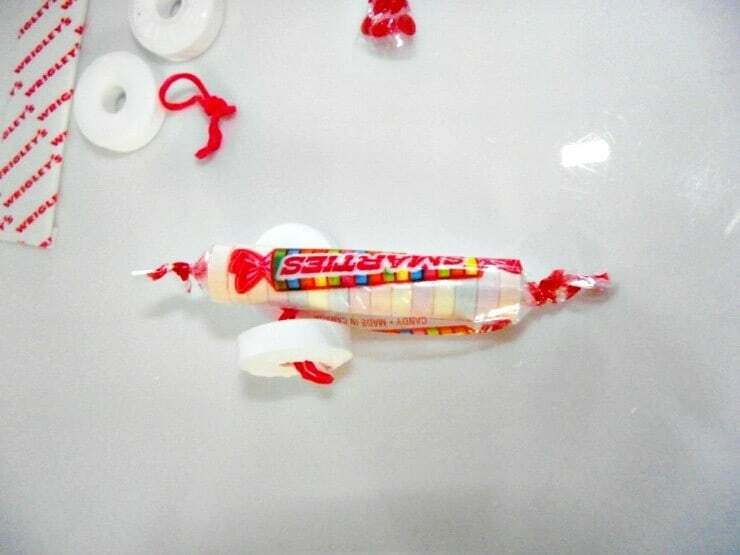 Slip the rubber band through 2 of the mints to make the wheels and place the Smarties (the body of the plane) in between. 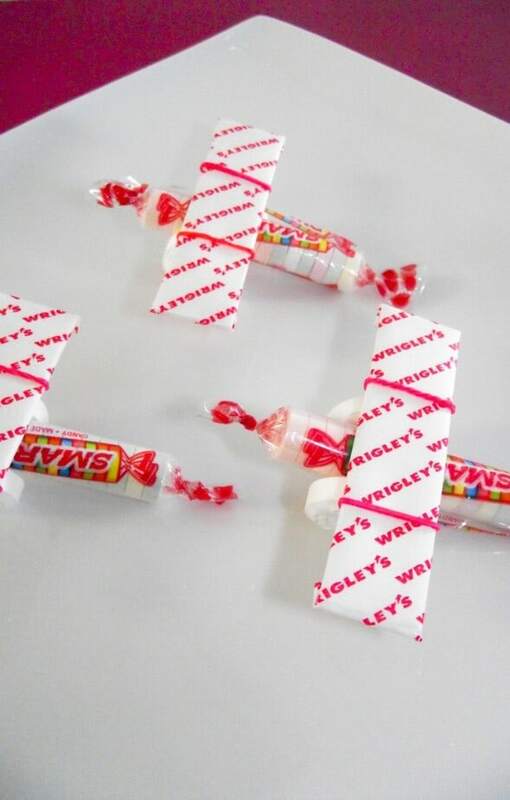 Lay a stick of chewing gum across the top of the Smarties and slip the rubber band over each side of the chewing gum to make the wings of the plane. Now, if you want to get a little more creative and spend a bit of extra time, here are a few things you can do! Lots of chewing gum comes in foil wrappers. You can wrap a piece of plain pink or red paper around the center of the foil wrapped gum and place heart stickers across the top of the “wings”. If your children are handing these out to classmates, they’ll likely want to attach a tag letting friends know who this fun plane was from. Tie a thin string from the tale of the plane and attach a tag for your child to write names on. You may want to print a fun tag with the words “Flying High On Your Love Valentine” to attach to the tale. This will look like the plane is pulling a banner through the sky! Have fun & enjoy! Check out the butterfly Valentine treats we made too! 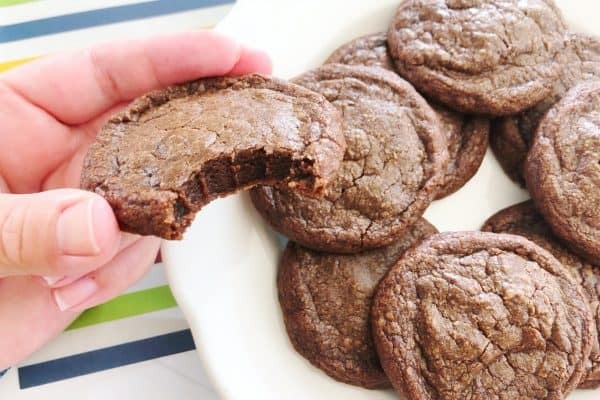 What a cute treat!! Love that! 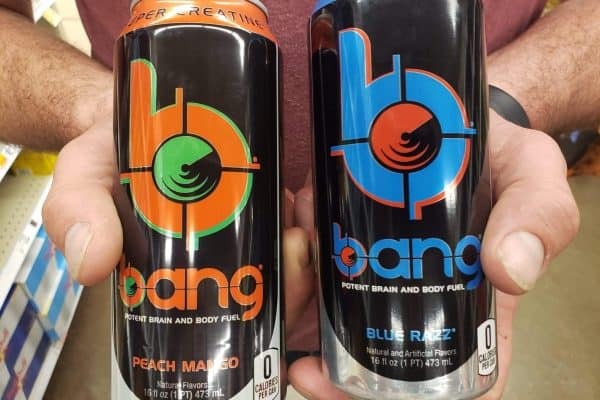 Great for boys! This might just be the most fun Valentine ever! Love this! These are really cute. 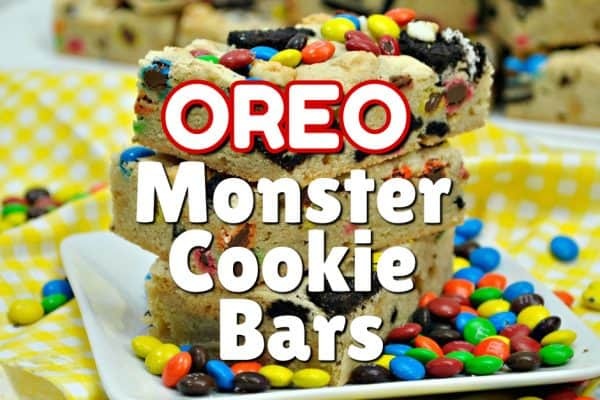 Thank you for sharing this great Valentine’s Day treat DIY.